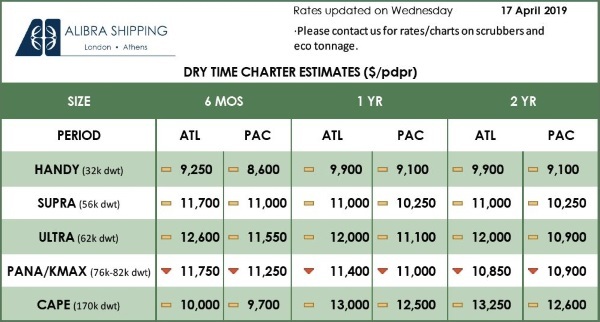 Europe could be set for more LNG imports in the coming months as a narrowing of the spread between the key European gas benchmarks and the Asian spot LNG price makes Europe a more attractive destination for spot Atlantic LNG cargoes. 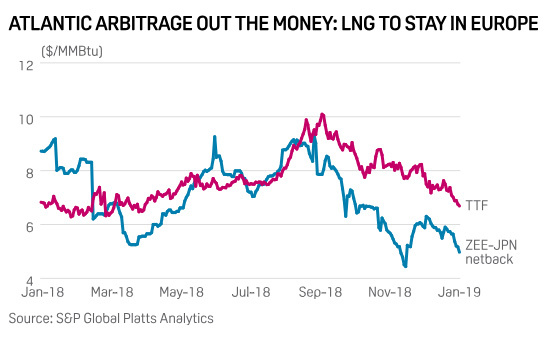 The arbitrage for sending Atlantic-sourced cargoes, such as US LNG, to Asia rather than to Europe is now firmly out of the money. It has been pushed down by the JKM-TTF spread more than halving since January 25 for delivery into March and the next two quarters. The JKM spot Asian LNG price has been falling in recent weeks, driven by lower Asian demand due to a mild winter and healthy stocks. European gas prices have also fallen on strong LNG imports, milder weather and robust gas stocks, but the spread to the JKM has still narrowed, with the Asian premium over the TTF for March now just $0.30/MMBtu from $0.80/MMBtu a week ago. 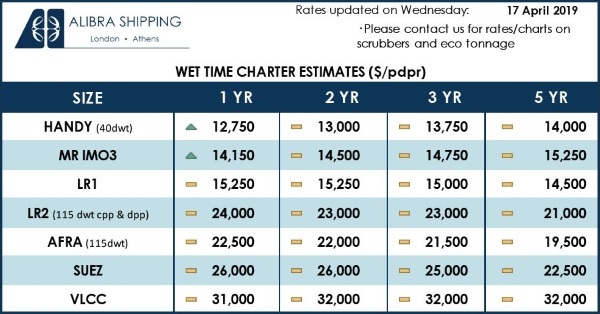 The Platts JKM price for cargoes for delivery in March was priced Thursday at just $6.975/MMBtu, compared with the TTF March price of $6.673/MMBtu. The situation is similar moving into Q2, with the JKM swap assessed at $6.976/MMBtu versus the TTF Q2 price of $6.53/MMBtu. 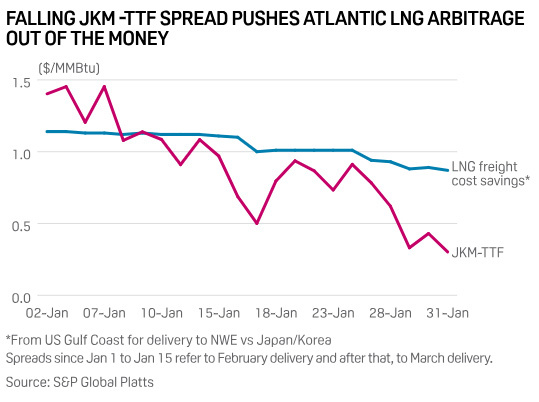 The economics of the so-called Atlantic arbitrage — Atlantic LNG cargoes diverted to Asia — moved through the week ending February 1 from being on a par with delivery to Europe to being out of the money. “The collapse in JKM and netbacks continuing to favour Europe does start to raise the question: ‘how low can European gas prices go?’ as Europe sees record imports against storage stocks close to three-year highs,” Platts Analytics senior manager Simon Wood said. said. “Storage will be full at the end of this winter. Where to go with gas this summer? The summer has downward potential if we don’t get a proper colder period,” another European gas trader said. A supply-driven push from LNG could put further pressure on prices and eventually be balanced by an increase in coal-to-gas switching, where gas-fired generation crowds out coal-fired generation, sending a bearish signal to power prices and carbon certificate demand. With European already absorbing growing LNG supply in ever-higher numbers, the picture is set to become even softer with US LNG set to ramp up this year, with peak LNG terminal capacity set to more than double from 3.4 Bcf/d to 7.8 Bcf/d ( 80.6 Bcm/year) by the end of the year. While the current economics suggest US LNG can still provide an operating margin under the 115% Henry Hub model and with US gas prices for Summer 19 below $3/MMBtu, the European netback to US Gulf Coast below $6/MMBtu is hitting a threshold that could hurt the bottom line of long-term capacity holders. The majority of capacity holders in the US have a tolling fee paid on a liquefy-or-pay basis, with its value ranging between $2 to %2.5/MMBtu for Sabine Pass and Corpus Christi terminals in the US Gulf Coast. “We may see LNG flows into Europe grow faster this year than in previous years,” Andrew Walker, vice president for strategy at US LNG pioneer Cheniere Energy, said at the European Gas Conference in Vienna. “Europe will play an even more important role in absorbing supply,” director of global gas analysis at the UK’s Centrica Gautam Mukherjee said, adding it was likely that the pattern of Asian demand lagging supply growth would be repeated in the coming years. “Currently we are naturally geared to go to the European market as basis margins are relatively close, and we don’t have to go through the NSR [Northern Sea Route] . So naturally our cargoes got to Europe today,” Novatek CFO Mark Gyetvay said.